We left the caravan park early and headed for Richmond ... and were there within just a few minutes. Ethel barely had time to warm up before we were pulling over and snapping away at Richmond's numerous old buildings. 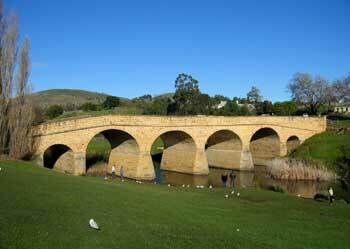 The town is perhaps best known for its 1823 stone bridge - the oldest road bridge in Australia - built by convicts. It was a glorious day for feeding the ducks by the river, and I even had something to feed them (leftovers from yesterday's feeding-frenzy at Zoodoo). 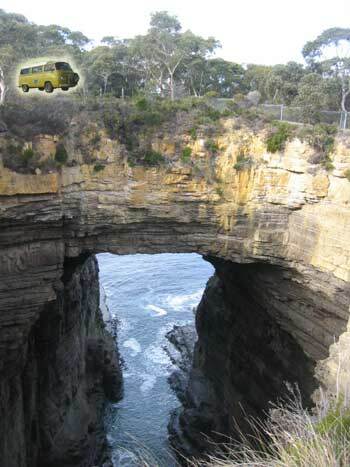 We carried on towards the Tasman Peninsula, almost a U-turn from Hobart where we had come from the day before. Along the way we stopped at several points of interest. First up was the Tessellated Pavement. Geology is a strange thing. Sometimes the natural world around us seems to have a wild, unpredictable nature, creating patterns that we couldn't dream of. And then there are places like this. 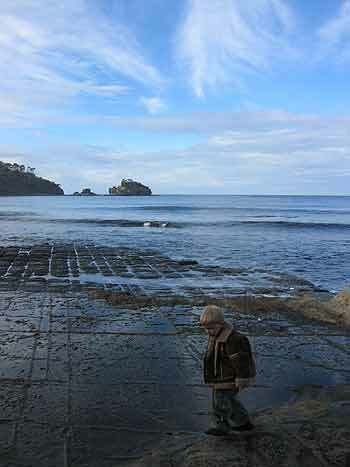 Honestly, if you didn't know better, you might assume that the Tessellated Pavement was man-made, the remains of a patio that has been pulled up leaving just the outlines of the grouting that once filled the paving slabs. The rock was scored with intersecting, rod-straight lines that looked like they might have been made with a scalpel blade or chisel. There was an information board that attempted to explain the phenomenon, but the science was lost on me. The Tessellated Pavement - geology at its uniform best. 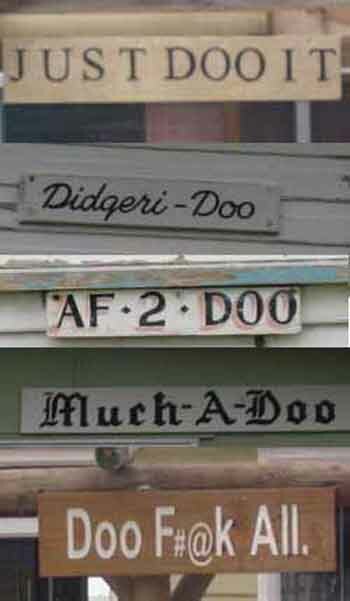 Doo-Town is not a town, but a bunch of locals getting together and deciding to have a bit of a laugh by naming their houses with a common theme - they all have the word Doo in them. All of them. There is a sign-post as you enter Doo-Town, suggesting that it's officially recognised. Well, it is by the tour guide books anyway. Reaching Port Arthur, we decided not to go into the historic site (Port Arthur is both the town's name in its greater sense and the historic site - locals refer to 'the historic site' when referring to that part specifically). The weather was not great, and it was mid-afternoon - better to settle there for the night and get up early next day, make a day of it. So that's what we did. Evening: added another animal to my list of 'Weird Australian Animals that I've Spotted'. As I walked across to the site kitchen, I saw a potaroo hop into view, decide that I was foe, not friend, then hop away into the bushes. It broke the boredom of spotting wallabies, of which there are hundreds around here, mostly visible at night.